Growing up, we used to have traditions that we would stick to. Like, we KNEW Christmas Eve was at my grandmothers... & we KNEW that you dont open gifts until everyone was up & could go in the basement together. Now, traditions aren't as important... not sure why. I think I like them. I'm the person who likes routine & consistency, but it seems like everyone around me, not so important.... so it gives me a bit of anxiety but I deal... & I still do traditions for the things I CAN control. Like, I'll still watch the Macy's Day parade on Thanksgiving day - I'll bake some sweet treats - I'll have some good coffee or hot chocolate & sit by the tree & watch an old Christmas show... even if I have to do these things all on my own, I'll still do them for my own heart. I loathe asking for help. I think the only time I'd ask for help if I was dying or a limb was falling off. But the ironic thing - I love TO help someone in any way I can. I know there's an irony in that.... can't help it. Papers. Not the typical "kitchen" answer, is it ? But it seems like my counter is ALWAYS full of papers. Bills to pay, bills already paid, crafty things I've drawn, my Bible study workbooks & notes, recipes, coupons. Yeah..... I need to become more organized. Smallest? I'm thinking of both the smallest thing in size & the thing you use every day that you just over look.... I dont know why, but dental floss came to mind. haha. Its true though. I guess I am thankful for it to keep my teeth clean... & actually I use it to make my pom poms for hats too... See? A true blessing. Biggest? 100% Jesus & His mercy & grace & the life He sacrificed for me. Being aware ... keeping those eyes open to know that every day is full of blessings that we so easily over look. 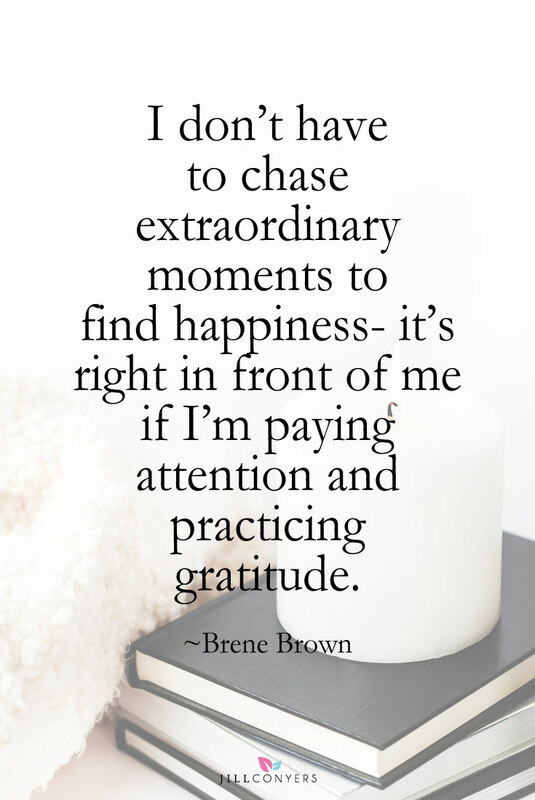 I love doing my gratitude journal every day to make sure I am totally aware of the blessings that carry me through every day. Speaking of which - Thankful Thursday is tomorrow if you want to link up with me. 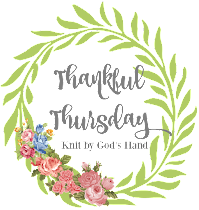 I do this EVERY Thursday... & would LOVE to see more people acknowledge the blessings in their life - be thankful YEAR ROUND & not just in November. So many of you have sent the kindest words & prayers for my mom. Yep - she's still in the hospital & is going to be in there for Thanksgiving at the minimum. She's scheduled for some tests on Thursday so not the holiday we were planning at all.... & while I was hoping for a relaxing & restful week off, its anything but.... but I'm taking my own thoughts on the last question - I'm being aware. Realizing that if I was at my new job & not able to go up to the hospital & sit for awhile & give my dad a break from there, it'd be a tougher week for our whole family. God's timing. Hope to see some of you around tomorrow for Thankful Thursday... the best one of the year when it falls on Thanksgiving! Sending good thoughts and prayers to your mom. Tradition is big for me around the holidays. We have family obligations, but I try so hard to stick to our own little traditions. It's how I grew up and I feel like it's so important to keep it going. Oh what a blessing it is that you have this week off to spend with your momma! I am sorry it had to happen this way though. It's hard for me to ask for help too. Thinking of you and your sweet mom! Thankful for you sweet friend and wishing you lots of smiles! I have a hard time asking for help, but like you am ready to help anyone as soon as they ask! I hope you have a wonderful Thanksgiving! I'm a mix of traditions and flexibility -- kinda have to be to survive as a human, I guess. :) I really hope your mama gets better soon! I'm terrible at asking for help/delegating, too. But I love to get my hands dirty and help with everything I can, especially during the holidays. We definitely still have some of our same traditions, but things change from year to year. I agree with Kristen - that's life, I think! I'm sorry your mom is still in the hospital. I am a mix of tradition and flexibility. New traditions are good too, and you can't have them unless you make room for them. I love tradition and even if it is just Mark and I at home we will continue to follow tradition. However, I want my kids around so badly. Happy Thanksgiving to you and your family. Prayers to your mother and yes God's timing is everything! I like traditions, but we are starting to be flexible on some and making all new ones with the addition of Zoe this year. I am excited for it I am so sorry your mom is still in the hospital. Prayers to her and hugs to you! I hope you have a Happy Thanksgiving! I love that you do your own thing regardless of anyone else joining in. You know I'm praying for your mom too. Please keep me posted!! Prayers going up for your mom. NEW JOB??? I have to get back in the swing of things! I sure enjoyed your HP even if I am late getting around to posts! Still praying for your mom and hope I find good news in a more recent post. Hugs.